Another week and more rain. The west county has been hit yet again by flooding. 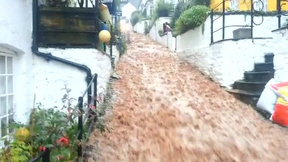 The village of Clovelly on the north coast suffered badly and now the problems are to do with the conjunction of high tides, strong tidal surges (big waves built up many miles away), low pressure (which always means slightly higher sea levels) and – and this is the unusual bit – a huge volume of water coming down the rivers from the moors and high ground. When that happens, when the tide surges into the river mouths and meets the water pouring down, the lower levels on the banks face what feels like a tidal wave sweeping through them. Places with the narrowest river mouths suffer most: Looe has been inundated by most of the high tides this last few days. Think how depressing it is to clean up only to know that you are likely to be hit again twelve hours later. Most people living in these conditions have flood protection devices: boards to close off the lower parts of the doorways often reinforced by bags of sand are commonplace. Sadly it isn't as simple as all that. Underground, unseen (of course) the soil becomes totally saturated and new water arriving has to go somewhere. All too often, having carefully dealt with all the entrances, property owners find it pushing up through the floor. 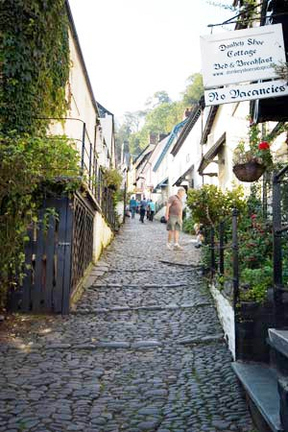 Clovelly is a lovely little village – still privately owned – with a narrow, stepped and cobbled high street which tumbles down to the sea. No cars or other vehicles are allowed into the village and most of the goods which have to be distributed are either taken down on sledges or are carried by donkeys. This high street was turned into a raging river earlier in the week. Not only was there damage to property but many of the cobbles were torn free and carried downhill. We know from your emails (and please keep them coming, we love hearing from you) that this extreme weather is not restricted to the UK. It seems to be a global problem and one that, if the scientists are to be believed, is likely to stay with us for some time. There is something ironic about the fact that copies of The Sea Garden have been shipped from the publisher and are, as I write, winging their ways to book shops and stores throughout the UK. I say ironic because, as the name suggests, one of the settings in this book abuts the 'sea'. That's not really accurate – it abuts the River Tamar and so this property, too, must have been at risk in recent days. I can tell you (normally I have to remain very quiet about books until after they are published) that flooding does not enter into this story. Snow, yes: fog, yes: floods, no. This picture of Walkhampton Common was taken about fifteen years ago. Those of you who have read Those Who Serve will know that Kate walked here a good deal with her dogs. 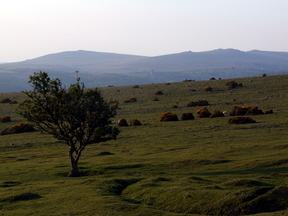 Note the hawthorn tree in the foreground. We are now in 2004. This is late autumn and the leaves have dropped from the tree which has been partially uprooted. A pond has formed in the hollow where it once stood. When we drove past this morning, there was very little sign of life. 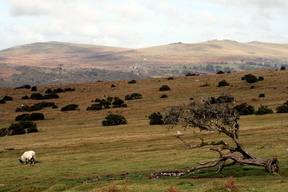 The hollow has gone - no doubt filled in by dust and debris - but the sheep continue to graze on this part of Dartmoor. There are one or two events that have yet to be sorted out – notably a signing in Waterstones of Exeter – and I will add this to the others in the right hand column as soon as I have details. If you would want to come to that, please keep an eye on the blog. I suspect that all of Marcia's readers know the story of Jay and her grave. Every day someone puts fresh flowers on the grave but nobody ever sees who does so. When we passed by earlier today,there was a single hydrangea head braving the rather dull day. If you don't know the story, let me know and I will tell you next week.